Mr. Spencer’s letter suggests a pattern of bias and interference in the work of an independent expert in order to favour an unserviced site for the new hospital. Update: We made inquiries about the allegations below after Alan Halberstadt wrote about them in his column in BizX magazine. On February 19, 2019, Windsor Regional Hospital wrote us a response that can be read at this link. 1. "We Do Not Concur"
​The calculations used to select the winning hospital site were materially different than those Mr. Spencer submitted to Stantec. This serious irregularity has not been investigated. 2. Infrastructure deficiencies at the County Road 42 were not flagged in the site selection evaluationThe need for a new watermain and greater hydro capacity raises questions of how the County Road 42 site was able to achieve a 70% score for its servicing. The capacity of the County Road 42 site’s Hydro One feeder is insufficient to absorb the load required for a hospital. This cost of this upgrade has yet to be quantified. ​3. 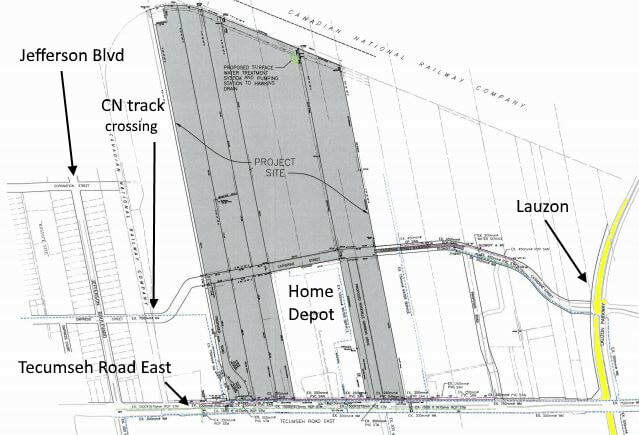 Why did Stantec not liaise with Mr. Spencer as agreed?The RFP required a determination of the probable costs to bring each site to a condition "which can be readily connected to municipal services including water, sanitary and storm sewers, electrical, natural gas, and other utilities." Mr. Spencer determined that the GEM site would require a new stormwater management lift pump station, while the County Road 42 site would require a wider watermain. The price differential for these additions is $580k more for County Road 42. Why did Stantec not liaise with Mr. Spencer before changing his cost estimates? Stantec Consulting originally informed him they were in agreement with his work. They also indicated they would liaise with his firm in the event of any required adjustments to the cost estimates. This needs to be addressed. Mr. Spencer's letter explains that there are two access roads to the GEM site from Lauzon Parkway (a 6 lane Class I arterial road with a centre turning lane): via Tecumseh Road (a recently upgraded 6 lane Class II arterial road), and Catherine (a short 2 lane Class I collector road). Lauzon Parkway serves County municipalities via E.C. Row Expressway and Highway 401. Mr. Spencer alleges the access route to the GEM site was changed to Jefferson Boulevard after he submitted his calculations. This is a significant alteration. In this way, $26.9M in unnecessary road upgrades were added to the equation. This is in comparison with $22.9M in upgrades needed for County Road 42. The decision to use a different access route without prior liaison with the Consulting Engineer needs to be addressed. ​Bearing in mind that Mr. Spencer already explained why the use of Jefferson is redundant, he notes that the stretch of Jefferson Boulevard in question is much shorter than County Road 42. Using the same cost per kilometre estimate used in the Lauzon Parkway Environmental Assessment, he alleges that the more realistic cost to widen Jefferson is closer to $5.1M, not $26.9M as stated. However, he also notes that Jefferson's infrastructure is in better condition than County Road 42. Therefore, the per kilometre road construction cost on Jefferson should be lower than on County Road 42. The $100k/acre ($6M) land cost for the 60 acre County Road 42 site is eclipsed by the $20M-$30M cost of upgrading its access roads. The $136k/acre land cost for the (up to) 77 acre GEM site is initially higher than the County Road 42 site, however its access roads via Tecumseh and Catherine/Lauzon require no upgrades. According to Rick Spencer, additional infrastructure to service the two sites costs $580k more at County Road 42 than at the GEM site. Significant additional costs favouring County Road 42 were subsequently allocated to both sites without consultation with him. The cost of upgrading hydro service to the County Road 42 site has not been determined and was excluded from the calculations. Upgrades to Jefferson Boulevard should not have been considered because it is not a primary access route. Even so, Mr. Spencer suggests that Stantec’s figures are overstated.